There are millions of people in the world who bear witness to the reality of enlightenment. A million people from every culture and from every era of history have experienced this ultimate spiritual epiphany. Among the most well known of the Enlightened are arguably Jesus, Buddha, Moses, Laotse, Socrates, Krishna, and Patanjali. Today, thousands of enlightened inviduals exist in one form or another. There are several religions in the world. Every real religion is based on the teachings of an enlightened individual or several enlightened individuals. Judaism was based on the teachings of Moses, Christianity on the teachings of Jesus, Buddhism on the wisdom of Buddha, and Hinduism on that of many. The center of a religion is that of enlightenment. Religion should lead to enlightenment. 2 What is a Scientific Proof? 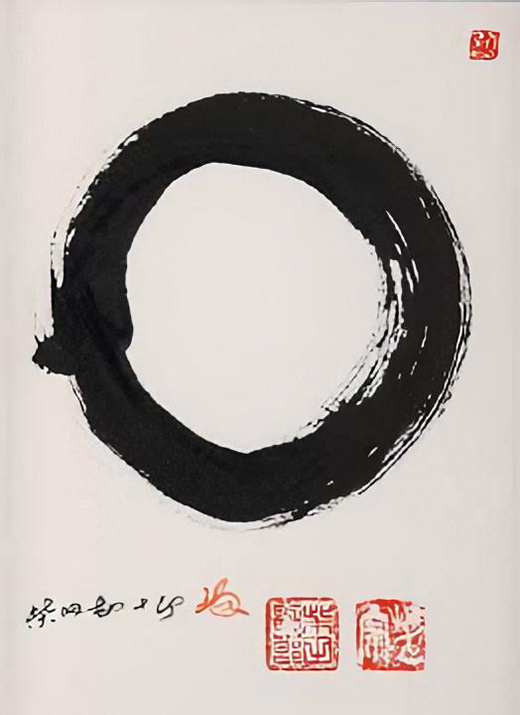 The Zen Circle is the highest that can be said about God. Moses: "The name of God is to be (I Am)." God is harmony. God is peace, love and happiness. God is truth and wisdom. God is a mystery. God is a mystery that can be seen and understand only by enlightenment. One can see God only in enlightenment. The Bible says: "Blessed are the pure in heart: for they shall see God." Who cleans his heart (his mind) with spiritual exercises, enters the dimension of God and sees God. You must be a saint (an enlightened one), to be able to know God in depth. A proof of God is therefore ultimately possible only through enlightenment. With funding of physics or logic, we can describe God very limited and therefore can prove only some aspects of God. Science cannot explore more than circumstantial evidences for God. If one really want to know whether God exists, one must realize enlightenment. Or one has to trust the enlightened as witnesses for God. There is no other way for the proof of God. God is proven by the enlightened. And there are many witnesses. Buddha said that all questions about God are senseless speculations. He pointed his followers to practice and to achieve spiritual enlightenment. Then they would understand and recognize. The majority of Christians do ultimately the same way. They say that God is not provable. At the same time God is the central element of their faith and spiritual practice. The majority of the Christians use the term God as a not to be proven fiction that leads to holiness. And then God will be recognized. The christian way and the buddhist way are identical. Except that in Buddhism the central witness for the existence of Nirvana (God) is Buddha. For all Christians, Jesus Christ is the central witness for God. Bankasius (atheist): Enlightenment occurs through auto-suggestion. Enlightenment is only an illusion. Nils: It's a big misconception that enlightenment is caused by auto-suggestion. The imagination of God, can help on the way to enlightenment. Enlightenment on the basis of auto-suggestion is a mental disorder and no enlightenment. Who, for instance, thinks he is God, but did not lose his ego and sees himself completely in his fellow beings, is on the wrong track. Anyone who thinks he is a great enlightened, but takes his fellow man not more important than himself has realized only a great spiritual ego. Those who do not go through the dark night of ego resolution, are not truly enlightened. 1st Enlightenment occurs when the tension in the body and mind are dissolved. In the Bible, this is described with the words: "God is found in silence." The tensions are caused by the stress of life and mental false reactions. Tensions can lead to mental abnormalities (neuroses) and psychosomatic illnesses. 2nd You can put it like this: "An unenlightened person is inwardly sick (not a holy, he has tensions in his body and his mind). An enlightened is inwardly healthy (whole, a holy)." 3rd Meditation and mental work are the two main techniques to resolve inner tensions. In meditation, there are various techniques. You can work with visualisations. Positive images can resolve internal tensions and mental disorder. The center of meditation is inner peace. Then all of the stored stress ultimately emerge by itself and dissolve. 4th The enlightened mind is characterized by inner peace. God is therefore no concept, but from the inner peace unfolds a higher consciousness. One can suddenly think better. The tensions are eliminated. The mental capacity is multiplied. One can think holistically (excluding an ego from the entire cosmic system). 5th By the purified mind he can recognize what God is. God is not a concept but the basic perception of man. A person sees all things as they really are. He sees everything in context. Where previously a man by his ego was fixated on himself, he now thinks and feels egoless as one with the cosmos. 6th If the tensions disappear in man, from the deep inner peace arises a deep inner happiness. The man is one with himself and the world. He feels peace, happiness, strength, love and clarity in himself. He has a higher perception. He can suddenly think above the higher dimensions in the cosmos. The space-time limitation is lifted. He can see in the past and future. He can see things in distant places. And he can transmit thoughts and energies to other persons. 7th An enlightened sees God as light in the world. He recognizes that there is a higher consciousness that permeates and directs everything. He is in his consciousness connected with God. 8th An enlightened person can look into the beyond and see the different worlds there. He can leave his body, travel there and give his fellow man on earth information about the afterworld. Nils: All the really enlightened see God. They describe it only with different terms. If you get enlightenment, you can recognize that the different terms base in the same experience of God. Only for the unknowing, the religions differ vastly. A mystic looks mainly to the common core, and this core is God. God works through all religions. I emphasize it again. God is a mystery. It can seen personal and impersonal. Different people have different spiritual paths. Important is what a person brings forward on the path of holiness (enlightenment). Max: I would have understood it if you had spoken instead of "God" from a level of relaxation. Nils: In the enlightenment one comes in contact with a mystery. This mystery can be called God, or else (Nirvana, Tao, Brahman, the Absolute, the higher truth). Since you are not enlightened, of course you do not know this mystery yet. If you know it, you'll find your own word for it. This term will lead you again into this experience. For some people this is the concept of God. Jesus spoke of the Father, Moses of the "I AM", some of the great mother and some just remain silent (Zen). The Christian God is a technique that can lead you to enlightenment. What you recognize is indescribable. Even Christianity says that God is ultimately a mystery. Atheists do not have to work with the idea of ​​a god. It is enough to meditate. The meditation can be a way into the mystery, if you practice it long and hard enough. Who knows the mystery, can describe it with different spiritual systems. Why is there the word God? Because it is helpful for many people to come to enlightenment. The center is enlightenment, not the word God. God can not be proven, because God is a mystery, and goes beyond the normal human understanding (the rational thinking, the four-dimensional system of thinking). What we can do is to prove enlightenment. That is enough. In the enlightenment, we learn that we are not only on a higher level of relaxation, but in a higher cosmic dimension. And an enlightened can test this. He gets special abilities. There are many levels of enlightenment. The more one grows in his enlightenment, the more abilities one has. These abilities have something to do with omniscience (infinite knowledge), omnipotence (unlimited power), omnipresence (present everywhere) and omnibenevolence (perfect goodness). Perfect goodness means to see the good in all and to act basically positiv. Infinitiv knowledge means to see over the higher cosmic dimension the future, the past and all over the world. For me it is more a feeling than a seeing. But I am spiritually evolved very little. The enlightened abilities are written down in the Yoga Sutra of Patanjali. But only a few enlightened have them. In India they are called avatars and in Buddhismus a Buddha (a fully enlightened person). Mother Meera and Mata Amritanandamayi are avatars. For a christian Jesus Christ has these abilities. What is a Scientific Proof? kidt: What is a scientific proof? Nils: In the scientific proof of God we are dealing with an empirical (inductive) proof. A quote from Wikipedia: Proof is a valid derivation of correctness (verification) or incorrectness (falsification) of a statement from true premises. The inductive proof comes from observations and experiences and can principally deliver no absolute certainty. The inductive proof is used especially in the law and the sciences . Deductive proof is mainly used in logic and mathematics and comes from a judgement made from premises or definitions according to established, logical methods of conclusion. Proof is rendered when the individual responsible for providing proof has convinced the judge in a court of the correctness of said proof. Wikipedia: A proof is supplied when the judge’s personal belief in the correctness of the statement of fact is given. A proof (in the words of the Federal Supreme Court) is whether the judge is personally convinced of the truth of the assertion of fact. It may ask the judge for his conviction no scientifically reliable evidence, but must deal with a practical degree of certainty to be content. The conviction of the court may rely on circumstantial evidence. kidt: What we cannot do is to change the opinions of the sceptics. The criteria is missing to accomplish that. Nils:The sceptics suffer from spiritual self-blockage. The sceptics should open themselves to understand, and indications would lead them to see the proof and the truth in these matters. Quote from www.karl-leisner-jugend.de/gottesbeweise: (quoted from original German) What is proof? In theory there are three types of proof: natural scientific proof, mathematical, and historical proof. The historic proof is examined under one-time circumstances, the physical proof is based on empirical data (observations, experiments, or experiences which can be repeated). Mathematic proof is of a purely logical nature. The problem in the discussion regarding the ability to prove something is the underestimation of historical proof. Things which happen only once and not in an experiment, and cannot be repeated in the context of an experiment, are called unproven by sceptics. In the case of historical proof, it deals with the ability to believe in the details of an incident and to put these details into question. Are the consequences and effects of the incident conclusive? Are there witnesses? Are there reasons for the witnesses to not tell the truth? It isn’t possible to experimentally examine these statements and findings. History happens once and cannot be repeated in a lab. Estimation is possible, and it must be estimated as to whether the witness are believable and real. For the psychological proof of God, it is sufficient that the enlightenment is mental and that an enlightened one sees God. God as a transcendent experience is already proven. There are many enlightened witnesses (for example Jesus, Buddha, Patañjali, Church Fathers, Teresa of Ávila, Dalai Lama, Swami Sivananda, Mata Amritanandamayi, Sri Anandamayi Ma, Mother Meera). Atheist: The proof of God has been rendered by TMS (transcranial magnetic stimulation). The Canadian neurologist Michael Persinger put on his subjects magnetic fields, and they are touched by God. God is the creation of certain brain areas. Thus, your witnesses evidence is nothing more than auto-suggestion. Theist: You make a major logical error, as many other brain researchers too. If God can be perceived by the brain (there are even certain areas of God), does this not mean that God is only in the brain. If an apple can be perceived by the brain, does this not mean that there is no real apple outside the brain. God can exist inside and outside the brain. Persinger did a psychological proof of God. Great thanks to him. TMS confirmed the fact of enlightenment. Enlightenment exists. The enlightened one sees God. Enlightenment is thus at least a psychological fact. As a condition of human consciousness enlightenment is already clearly established. The big question is whether God really exists outside the brain, such as the above mentioned apple. There are many facts such as the quantum physics, the supernatural experiences (for example, the cures of Lourdes) and the statements of the enlightened. The physical proof of God is that God not only exists in an enlightened, but also as an outer reality. The physics is approaching the realization that there are one or more higher dimensions in our universe (String theory). God as an old man (the highest Master) and his son Jesus (the Enlightened) are blessing Mother Mary and her children (us, the angels) with the Holy Ghost (light, the enlightenment energy). In Christianity, God is defined as Father, Son, and Holy Ghost. From this point of view comes the threefold proof of God’s existence. The threefold proof is attained by bringing spirituality and science together into a cohesive harmony of concept. 1. God as the Father is a higher consciousness field in the cosmos. God is cosmic energy (light). Albert Einstein proved that the cosmos are composed of energy. According to Amit Goswami (The Conscious Universe, 1992) consciousness is the highest form of energy. This point is yet to be researched in detail, but one can already see that modern atomic physics and spirituality are coming closer and closer to one another with their conclusions. 2. God as the son is every enlightened being. This encompasses God’s consciousness. There are many enlightened people on earth. The reality of enlightenment can be scientifically proven. One only needs to ask these enlightened individuals questions and test their specific abilities. This is already being practiced via brain research. Christians need to drop the notion that Jesus is the one and only enlightened to have ever existed. This idea is psychologically understandable but scientifically unacceptable. 3. God as the Holy Spirit is the spiritual energy (aura, energy field) that every sensitive being can sense around him or herself. This can be perceived as light, water, power, love, peace, unity, and bliss. The Holy Spirit can disolve tension and heal sickness. It can strengthen the ability to heal oneself. It can affect peace, inner bliss, and enlightenment. The Holy Spirit can be generated via spiritual exercises or from enlightened masters. If an indivual doesn’t possess a form of spiritual energy, the existence of God is emotionally difficult to comprehend. In 1987, Nils practiced Yoga every day for thirty minutes for half a year when he suddenly perceived this trace of energy. He had a brush with transcendence. He could feel the energy of his students when instructing Yoga. He felt united with the entire world in grace and mercy. In order to classify this spiritual energy, it still needs to be researched in a scientific fashion. One can assume that it has to do with a sort of connection to a higher field of cosmic information (a higher cosmic dimension). This spiritual energy has an especially significant meaning for the healing of psychological ailments, in terms of working with this energy to heal. Energy healers use this energy to cure various ailments and sicknesses of a mental variety. This has been documented in many films. Spiritual energy could be referred to as a holy ghost because it seems to come from an entirely different dimension. With this energy, enlightened and highly developed spiritual people can help others. The bible describes how Jesus poured this energy onto his disciples on Pentecost. He filled his followers with this spiritual energy. The followers felt radiantly and divinely happy and radiated an aura of pure light and felt tiny flames of energy from their heads (this could be interpreted as the activated skull chakra). Wolfgang: "How can you justify your presumption that God exists?" The statements of the enlightened. They see God as light in the world in the form of love, peace, and happiness. God is a term for the perception of the enlightened. Every real religion establishes itself around an enlightened master. The near death research refers to the independence of the soul from the body and the continued existence of the soul after death. Wikipedia supports my view on these things. At the same time, Wikipedia also brings up the arguments of the opposition. Everyone can read the discussion there. The most important witness is Pam Reynolds. She has seen the light of God in the afterlife, and learned that there is a paradise area. She has also demonstrated that her otherworldly experience was real. She heard the doctors during her out-of-body experience and could reproduce exactly the conversation later on. The gauges showed during her out-of-body experience that her brain could not think. There were no brain waves. And yet she has heard the conversation. Pam Reynolds could have heard the conversation of the doctors only with her soul. Her ears were stoppered while the operation. However these experiences have been duplicated by people suffering oxygen deprivation too. Reincarnation research has referred to many cases of rebirth. Buddha knew his earlier lives. A good overview on reincarnations research can be found on Wikipedia. The most important and well researched case is Shanti Devi. Physics refers to the existence of a higher cosmic information field (Amit Goswami, God as higher consciousness). The string theory supports this point of view. Parapsychology researches spiritual abilities such as thought transfer, the ability to see into the future, and to perceive and sense over large distances. This field has collected many cases of aforementioned topics. Scientific happiness research has proven the context between enlightenment, peace, happiness, and love. They have recognized the principles which lead to a happy life. They have researched Matthieu Ricard as an enlightened person. I live as a Yogi. I have been in various states of enlightenment. I have seen God as light in the world, and as happiness, love, peace, and truth in myself. I maintain that enlightenment and God exist. I maintain that it is better and happier to be enlightened than unenlightened. I maintain that it is good to live in God." Jesus blesses us with wisdom (spiritual knowledge, the way of enlightenment and all-embracing love). Nils: We have to understand, that God is a mystery. There is no complete definition of God. It is impossible to describe and define God. We only can experience God and then say some things about that. Most important is, that God exists for sure. You can experience God. Jesus did it. Many catholic mystics did it. Many mystics of other religions did it. The differences come from the culture, the language, the depth of the experience and the way to the experience. For me God in his center is the same in all religions. All mystics with a deep experience see the same. The most important difference is the way to God. There are many ways to get enlightenment. There is the buddhist way. And there is a specific christian way. This is the way of love to God and to all other people. glorin: What do near death experiences and enlightenment theories have to do with one another? Nils: When dealing with enlightenment theories, we are dealing with two things, the psychological and the physical proof of enlightenment. For the psychological proof, we don’t need near-death research. It is enough that enlightenment exists psychically and that the enlightened see God. God as a transcendental experience is already proven. There are enough enlightened witnesses who have attested to it. The physical proof of enlightenment indicates that God doesn’t just exist in the enlightened, rather is also an external reality. There is an afterlife, there is a world of light in the afterlife, there is a soul which can live in the dimension of God after death. Body and soul are then independent of one another. To prove that, we need the near-death research, and also the proof of the Karmapa. Shui: What happens then? Do you float above the body or through a jolly tunnel? If these experiences are really paired with life after death, it poses the question as to why there are such different experiences described. Nils: First you float above the body. When the observation of the operation starts to get boring, you can continue your journey via the jolly tunnel to the light world. You can do both or either as a soul. There are two different levels (realms) in the other world. Shui: These people were NOT dead, rather almost dead. Consequently, it wouldn’t be right to say that is what happens after death as these people were not really dead. If the heart stops, and they are pronounced medically dead, then they can be examined and this information then considered valid. Nils: These things have been researched. For the cases of after death, there is the Karmapa case. From the near-death experiences, we can come to the logical conclusion that the soul is independent from the body. Shui: Feelings are hormones. You can create feelings through hormones. What is so special about that? Nils: That is the double-quality of feelings. They can be created through hormonews. But they are also consciousness energy. For that reason, they are also independent of the body. The fascinating thing is the duality of body and consciousness. After death, consciousness separates itself from the body. It lives in the afterlife. Shui: The scientific problem is simple. We don’t know what consciousness is, and therefore we cannot fully comprehend why hormones create feelings. Nils: Thank you for this sentence. We don’t know what consciousness is. Therefore, we don’t know what enlightenment is, and therefore we don’t know what God is. We don’t know if there is a body with an independent soul. These things are still not touched upon by science. The near death research and the death of the Karmapa disprove the one-sided materialistic explanations. They should also cause you to think. Rise above the limited model of materialistic explanations. Shui: Everything that you experience through enlightenment are feelings and could simply be a result of hormones released through the brain. This also explains the similar experiences of others under the influence of drugs. Enlightenment could be anything. Nils: You don’t want to understand. You see it as purely physical. I will try to explain it again. It principally deals with happiness. Enlightenment is psychology. Enlightenment is a way to create inner bliss. That can also be achieved with drugs. Drugs, however, destroy the body and the soul. Then the person isn’t happy anymore. Along the way to enlightenment it is better to create inner bliss using systematic thought work and regular meditation. You then live healthily, think positively, and have a happy life. The further you spiritually develop yourself, the larger and more stabile the inner bliss. At some point in time, you land in transcendence. You find unity with the cosmos. You see God. You have a consciousness experience that many would consider God. You could also describe that experience as Tao, Nirvana, or Brahman. The second question is whether God is real and whether God exists in the external world. Physics entertains the idea that there are several higher dimensions in our cosmos. There are possibly higher information fields. There is probably an all-encompassing consciousness which exists behind the material cosmos. That would be God in the external form. According to the experiences of the enlightened, the consciousness of the enlightened connects itself with this higher consciousness dimension. The enlightened are not only happy, but they can deal in this higher cosmic dimension. They have special abilities. 1. The statements of the enlightened. They see God as light in the world in the form of love, peace, and happiness. God is a term for the perception of the enlightened. Every real religion establishes itself around an enlightened master. Every real religion has a word for God (Tao, Nirvana, Brahman, Allah, Yahwe). 2. The near death research refers to the independence of the soul from the body and the continued existence of the soul after death. Wikipedia supports my view on these things. The most important witness is Pam Reynolds. She has seen the light of God in the afterlife, and learned that there is a paradise area. She has also demonstrated that her otherworldly experience was real. She heard the doctors during her out-of-body experience and could reproduce exactly the conversation later on. There were no brain waves showed during her out-of-body experience. Her ears were closed. And yet she has heard the conversation. Pam Reynolds could have heard the conversation of the doctors only with her soul. 3. Physics refers to the existence of a higher cosmic information field (Amit Goswami, Professor Dürr). 4. Scientific happiness research has proven the context between enlightenment, peace, happiness, and love. They have recognized the principles which lead to a happy life. They have researched Matthieu Ricard as an enlightened person. 5. I live as a hermit. I have been in various states of enlightenment. I have seen God as light in the world, and as happiness, love, peace, and truth in myself. I maintain that enlightenment and God exist. I maintain that it is better and happier to be enlightened than unenlightened. I maintain that it is good to live in God. My parents are atheists. After my studies, I became a lawyer. When I was thirty, I found my spiritual calling in addition to my profession. In November 1986 I had my first big enlightenment experience. During a meditation while lying down, I was lifted for a short time in the highest heaven. I became one with the all-encompassing love of the cosmos. I experienced extreme happiness. I was suddenly able to understand the holy books written throughout mankind's history at a deeper level. The high point of my spiritual experience was what I felt as the entrance of the Holy Spirit. A thick beam of energy flew from the sky and into my crown chakra. The energy flowed through my body and filled it out completely. On my head was a flame of energy. Spontaneously arose in me the thought that now I have been blessed by the Holy Spirit. I felt the energy beam as a descent of the Holy Spirit. The basis of the term God is the experience of the enlightened. The proof of God must start with this point. God is a mystery that can be seen and understand only by enlightenment. One can see God only in enlightenment. A proof of God is therefore ultimately possible only through enlightenment. With funding of physics or logic, we can describe God very limited and therefore can prove God only some aspects of God. Science cannot explore more than circumstantial evidences for God. If one really want to know whether God exists, one must realize enlightenment. Or one has to trust the enlightened as witnesses for God. There is no other way for the proof of God. God is proven by the enlightened. And there are many witnesses. In the enlightenment, we learn that we are not only on a higher level of relaxation, but in a higher cosmic dimension. And an enlightened can test this. He gets special abilities. The more one grows in his enlightenment, the more abilities one has. Enlightenment occurs when the tension in the body and mind are dissolved. In the Bible, this is described with the words: "Blessed are the pure in heart, for they will see God. Who cleans his heart (his mind) with spiritual exercises, enters the dimension of God and sees God. Meditation and mental work are the two main techniques to resolve inner tensions. The enlightened mind is characterized by inner peace. From the inner peace unfolds a higher consciousness. An enlightened sees God as light in the world. He recognizes that there is a higher consciousness that permeates and directs everything. He is in his consciousness connected with God. One can think holistically. One sees everything in context. Where previously a man by his ego was fixated on himself, he now thinks and feels egoless as one with the cosmos. The man is one with himself and the world. He feels peace, happiness, strength, love and clarity in himself. Enlightenment exists. Atheists cannot really argue against it. God exists for sure. You can experience God. Jesus did it. Many mystics did it. For me God in his center is the same in all religions. All mystics with a deep experience see the same. The most important difference is the way to God. There are many ways to get enlightenment. There is a specific christian way. This is the way of love to God and to all other people. Love to God is the love to the goal of inner peace and holiness. The love to all other people tranforms your spirit into a unity consciousness. Search for Existence of God on Wikipedia. Search for Quantum mysticism on Wikipedia. ---> Download the Wikiversity Book God in various formats (PDF, Epub, Kindle) for reading and give away. This page was last edited on 31 July 2017, at 03:06.